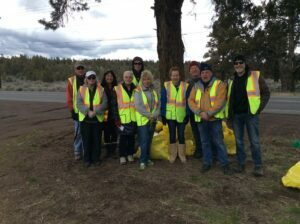 Our dedicated group of volunteers met on this brisk Saturday morning in early April to complete our semi annual ODOT cleanup commitment. With the threatening snow and rain just staying at bay for our group, we were thrilled to get such a terrific turnout of twenty people. Our group met at the traditional Highway 20 location, about ten miles south of Sisters. Richard’s donuts and fresh brewed Starbucks coffee fueled our group. We felt badly that we ran out of donuts towards the end of the morning and will keep this in mind for our next event. 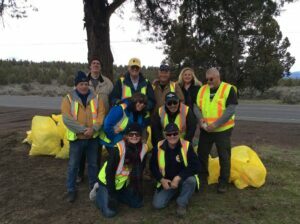 Our terrific group headed out to collect roadside trash and debris, filling the bright yellow ODOT bags. Once again, "trash" prizes were on the line, along with Jerry's hidden cash prizes. It is interesting to note, when Jerry and his wife Gretchen were planting their cash prizes totaling $20.00 dollars, they found a folded group of bills totaling $61.00. Who knew that the High Desert Region presidency was a money maker. Congratulations Jerry and Gretchen!! The winning prize for the "heaviest bag of trash" was too close to call. Congratulations to both Paul Vallerga and Kerry Madsen for their shared victory. Congratulations also to Pete Olson for finding the little stuffed lamb, which won the prize for the "most unusual/unique item found." The variety of seven different cash prize bills hidden by Jerry and Gretchen were located. One prize required a little "directing" from Gretchen, but we can say this year that no cash was left on the field. Thank you all for your diligence!! About half of our group returned in a timely manner but the others were no-where to be seen. We decided that a search and rescue team was needed to find the "lost souls." The wayward group was located, with mounting debris and in need of ODOT bags. That is why we have separate group #1 and group #2 pictures. Congratulations to one and all for a very successful morning. We look forward to having you join our group for the next cleanup Saturday in the Fall of 2017. It is a fun, social and relaxed time when we do something worthwhile for our beautiful community. Our club continues to be dedicated to this semi annual obligation and its desire to assist in keeping our Central Oregon highways green and clean. With our sincere and heartfelt thanks to our amazing Saturday morning group. Your efforts and commitment on such a brisk morning were greatly appreciated. We look forward to seeing you next time.